Pregame traditions are a part of every major sporting event. On Saturdays in the Fall when the Cavaliers are at Scott Stadium the tradition inside the stadium begins when a real-life Cavalier charges onto the field on his horse, Sabre, with the football team following behind. This brings the crowd to their feet and pumps up the team. For over eight decades Scott Stadium has been the home to many great teams and players. The stadium was built to replace Lambeth Field and was a gift from Frederic and Elisabeth Scott in honor of Scott’s parents. 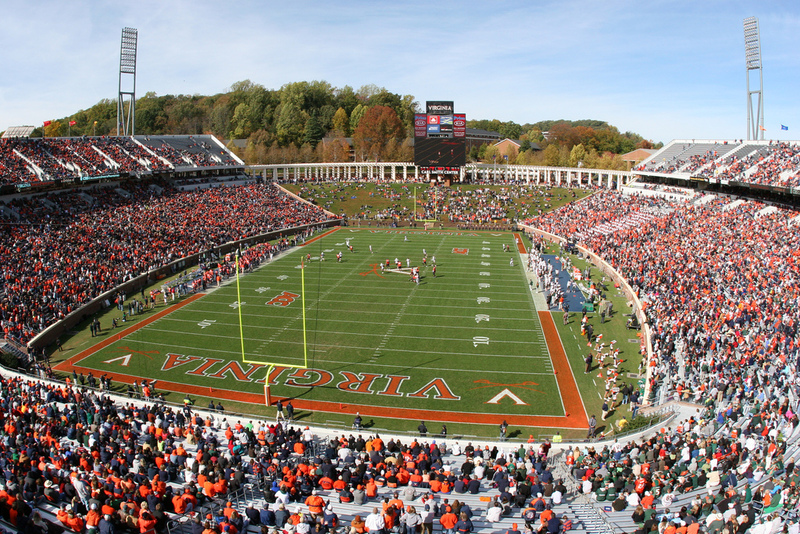 The 22,000 seat stadium opened on October 18, 1931 as the Virginia Cavaliers battled the nearby VMI Cadets. For four decades there were few changes at Scott Stadium. The stadium began to show its age in the early 1970s leading the university to renovate the stadium. By the start of the 1974 season, the old wooden bleachers were replaced with aluminum bleachers, the brick work was restored, and the grass field was replaced with Astroturf. Before the start of the 1980 season, construction on upper decks on both sides of the playing field were completed, increasing the seating capacity at Scott Stadium by 12,000. A new press box and Presidents box were also constructed at this time. The first night game at Scott Stadium was played on October 29, 1982, using portable lights, leading to the installation of permanent lights the following year. In 1985, Bryant Hall was constructed on the south end zone, providing new locker rooms and a dinning facility. The largest and most significant renovations at Scott Stadium occurred in the 1990s. In 1995, the Astroturf was removed and replaced with grass and in June 1997, UVA Alumni Carl Smith pledged $25 million to towards further expansion of Scott Stadium. In 1998, a new videoboard, known as Hoo Vision was installed at the north end hillside and has since been updated and enlarged. By 1999, the lower level of the south endzone was enclosed and by the start of the 2000 season the upper deck was enclosed. This latest renovation also included new locker rooms, expanding the press box and Presidents Box, adding 44 luxury suites, and the pergola plaza above the north hill. Today Scott Stadium seats just over 60,000 fans. The main two tier grandstand surrounds most of the playing field. On the north end is the hill where fans, mostly students, watch the game from a grassy area.